#0208-SQL Server-SET options-NOEXEC v/s FMTONLY-Does FMTONLY really execute the query/workload? When the FMTONLY option is exercised, the query is actually executed to return the meta-data, but no records are processed. However, this behaviour is not intuitive. Here’s a follow-up question that I received in my post related to FMTONLY. When you try to execute a query that have side effects (like an INSERT) with FMTONLY ON, you can easily check that the row is NOT inserted. 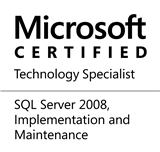 I just tried this on SQL 2008 (not R2). Can you confirm this? If this is true, how is FMTONLY different from NOEXEC? --NOTE: The MyTest table does not exist! Running the entire script against my test SQL Server instance (tested on SQL 2008, SQL 2008 R2 and SQL 2012) yields the following results. 00. Setting base state – both NOEXEC and FMTONLY are now OFF. 01. Now checking whether MyTest already exists or not. If the ObjectId is not printed after this line, object is non-existent. 03. NOEXEC is now OFF. Now, because the attempt with FMTONLY resulted in a batch termination, allow me to return my server back to the base state. I trust that the above demo answers all questions that one may have regarding the differences between NOEXEC and FMTONLY. If you have any other questions, please feel free to send them over to me. I will be glad to help! This entry was posted in #SQLServer, Blog, Imported from BeyondRelational and tagged #SQLServer on October 29, 2012 by nakulvachhrajani.